A Naval Criminal Investigative Service map passed out to sailors visiting Los Angeles for Navy Week gives a block-by-block guide to the San Pedro drug market. The Navy apparently wants sailors to stay clear of certain streets that had been outlined in red. 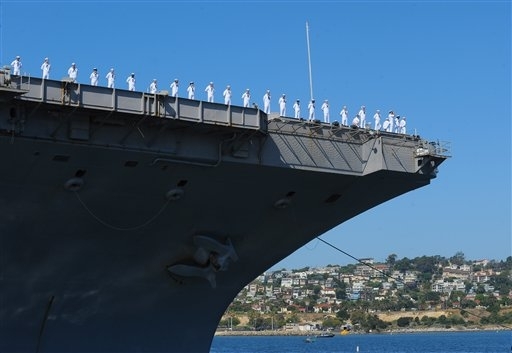 Judging from a copy of the map that appeared on Dailybreeze.com, it looks like sailors disembarking the carrier Abraham Lincoln will have to navigate between two parts of San Pedro. There’s another questionable area nearby, too. According to the website, the reverse side of the map highlighted attractions in nearby Long Beach, a twist that ticked-off the San Pedro Chamber of Commerce, which had hoped the visiting sailors would spend some money in their restaurants and shops. The chamber also didn’t care for the Navy’s portrayal of San Pedro as a place where drug deals are routine. While the Navy certainly wants sailors to avoid any sort of illegal activity while on shore, isn’t this map also a kind of guide on how to find trouble? My son is serving on the USS Abraham Lincoln. The sailors know that they are not allowed to use any drugs if they want to stay in the Navy. With the economy the way it is, the sailor would have to be willing to jeopardize their to go searching for trouble like that. to permanently dock ex USS IOWA (BB 61. It’s turned into a large joke around here, with many patrons & sailors asking me: ‘ is it safe to come in here?’ We have had a few laughs. NCIS unfortunately gaffed on this one, and look for an apology from it in days to come. Hey, we all make mistakes. Navy week was a huge success, – however you look at it!. It just had one hiccup from Navy Intelligence. (If this is the worst thing that happens, I will be very happy).